Scheduled Meetings: First Monday of month at 7:00pm in the Family Center. Mission Statement: A Catholic fraternal organization of men dedicated to the principals of Charity, Fraternity, Unity and Patriotism. The most important of these is charity. Current Activities: Visit our website and discover a variety of program services and activities to help our parish, school and community….and, yes, social events! Our success today, as it has from our beginning in 1991, comes from our involvement and commitment to church, community, council, family and youth. The Knights will be holding their Spring "Tootsie Roll" campaign after all masses, April 6th and 7th. Proceeds benefit the local Programs for Exceptional People, which is dedicated to enhancing the lives of adults with special needs. The Knights want to thank you in advance for your support. We wish to express our appreciation to St. Francis parishioners, friends, donors, and volunteers, who made our recent annual Spaghetti Dinner and Silent Auction an enormous success. All proceeds benefit the mentally and physically challenged. Thank you for your contributions! Look for us again in 2020! For more photos of the 2019 Spaghetti Dinner, please click on the photo above. 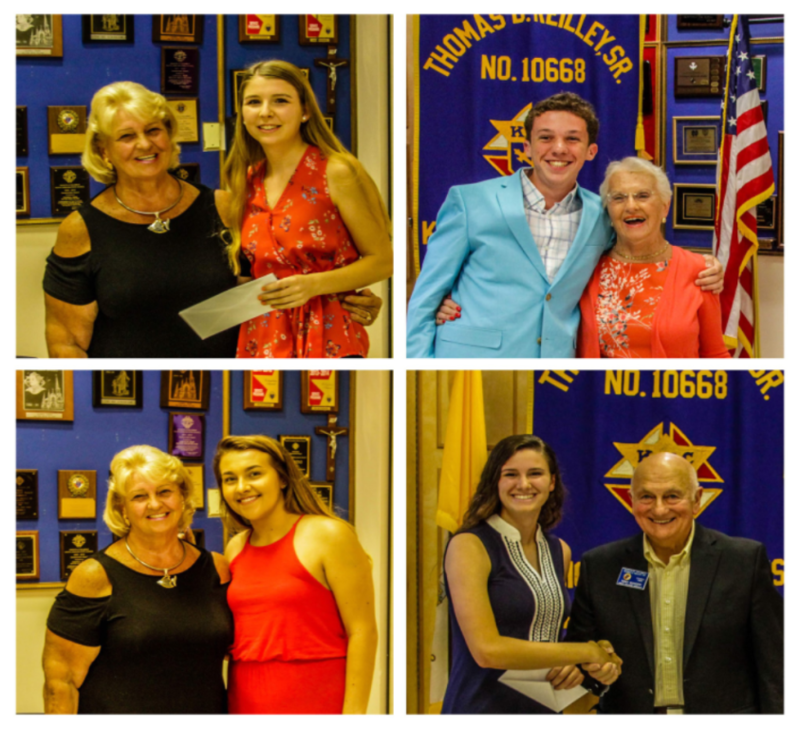 One thousand dollar ($1,000) scholarship grants were presented to eight students by the Knights of Columbus Thomas D. Reilley, Sr. Council No 10668 in Hilton Head. Seven collegiate and one high school grant went to children and grandchildren of parishioners. Funding for scholarships is made possible by the Jack Politch Memorial, John Boyle Memorial, and council charities. Recipients include: Theodore Oldham, who will attend St. John Paul II High School, Ridgeland, SC; Abigail Barker who plans to attend University of Georgia; Catherine Heavey, attending Loyola University, New Orleans; Kaeleigh Judge, attending Clemson University; Megan Kriscovich, attending University of Georgia; Adam McGahay attending Illinois University; Carson Schoeppe, attending Campbell University; Casey Sullivan, attending Florida Atlantic University. 300 men of all ages belong to our council. Brothers can participate in 24 major service events ranging from parochial services in the church building to fish fries and spaghetti dinners in the family center to sponsoring sports tournaments in the school gym. 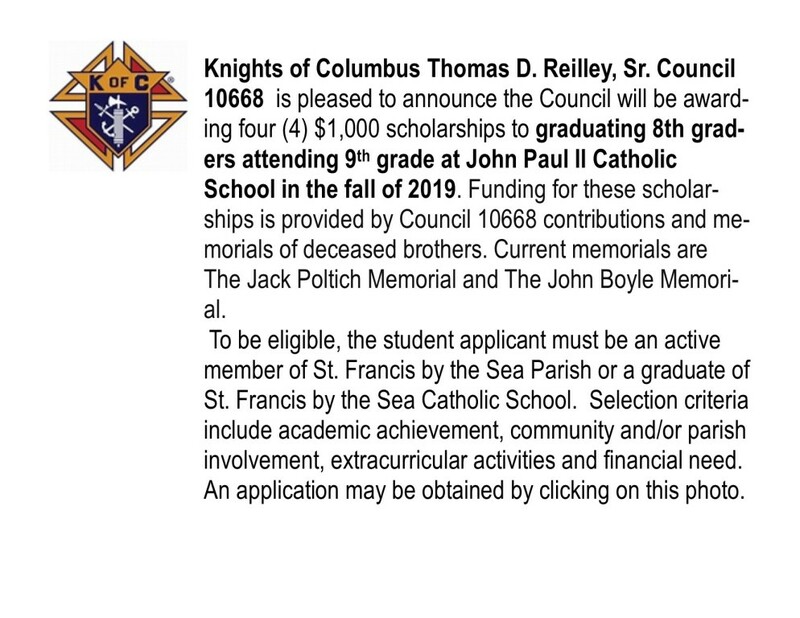 $8,000 in scholarships: $4000 for 8th graders attending John Paul II high school & $4000 in college scholarships for graduating high school students. Our deep involvement and support of residents in our community with intellectual disabilities has raised tens of thousands of dollars. We are dedicated to a Culture of Life from pregnancy through senior living. Become a Knight: Contact our Membership Director Bill Burger (843-681-8815). Visit our website for more information and photographs. 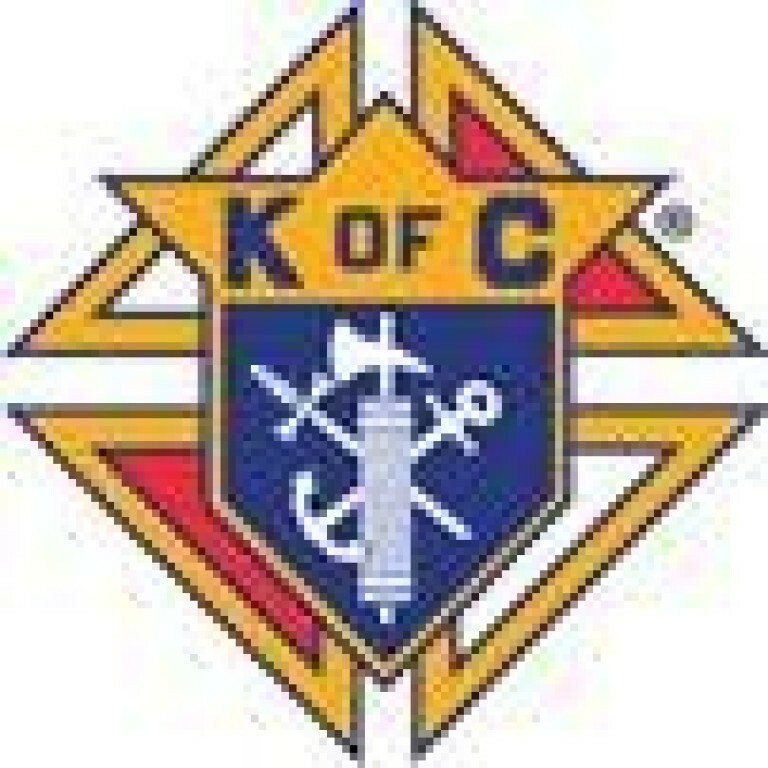 To contact Knights of Columbus, enter the information below.